Is an all-season, all-inclusive family resort the perfect vacation for your group? What do you picture when you imagine a multi-generational family vacation? How about a vacation for your small family which includes toddlers – or worse – teens! A nightmare of planning? No possible solution? A huge cost factor? A plan where someone’s preferences have to give? Not when you plan your vacation at Woodloch Pines Resort, located in the beautiful Pennsylvania Pocono Mountains. Woodloch Pines, celebrating their 55th season, caters to families, big or small, and offers everyone a chance to relax, unwind, and spend quality time together in a scenic setting. When my family of five visited in September, we got to see firsthand how amazing taking time in the great outdoors can be! Woodloch Pines Resort is a 1000-acre, all-inclusive resort located about 3 hours from Philadelphia and 2 hours from New York. They make no bones about letting you know that they cater to families, but with a personal feel. Lodging options include simple, spacious, well-appointed rooms, as well as suites with kitchenettes and private patios. The buildings are just a short walk to the main lodge or parking area. 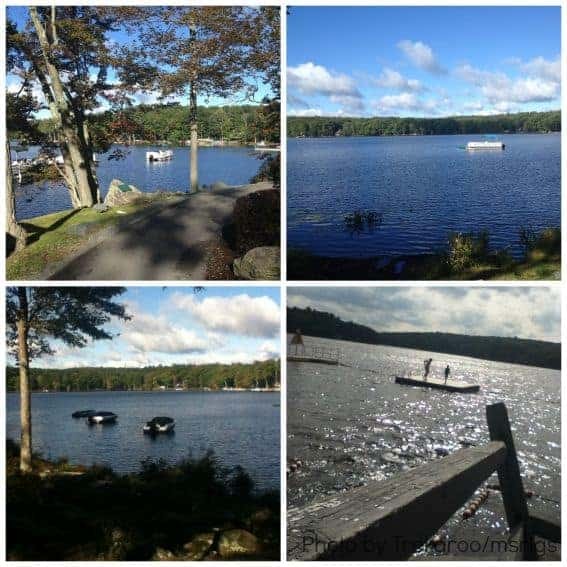 All are situated around a gorgeous 150-acre natural lake. Private guest homes for larger groups are located just down the road. These guest homes offer up to five bedrooms and contain full kitchens. Should you need them, each building also has its own coin-operated laundry (great for unplanned outfit spills or for longer stays.) Also, don’t worry if you have a family member with wheelchair needs; each building is handicap-accessible. We stayed in Springbrook, and although there’s a shuttle that can take you around the grounds, we had no problem making the short scenic walk to the main building for meals, shows, and to check-in and check-out. The activity center is also just across the street, so you’re never too far from anything. I especially like the biking, where you just hike up to the small barn, pick a bike, and head out on the paved trail through the trees. It was so low-key and just like home where you decide to ride, and off you go. My kids liked the go carts and the shooting area where they could shoot a paintball gun or a shotgun if they were old enough (ammunition is an extra cost). I also made sure they tried the archery range since my tween son had recently been asking about it. It was a nice way to explore an activity he was interested in, in a fun setting with no pressure to perform well. He was thrilled! Think all of Woodloch’s activities take place during the day? Not at all. Nighttime activities include a variety of shows, magicians, singers, comedians and more. There is also a nightclub if you’d like to relax and unwind at the end of a day of fun. We went to see the magician and my kids were laughing out loud at his shenanigans! It was a fun way to share some entertainment and laughs as a family after dinner and before we retired for the night. After all, when was the last time you all sat around and laughed at live entertainment? 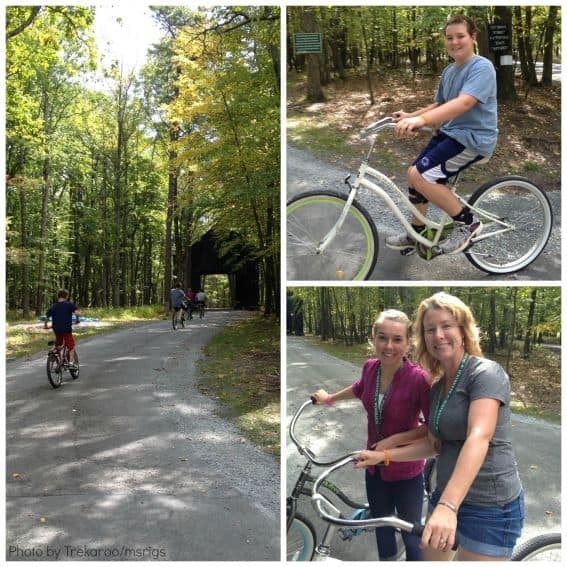 Read about more activities offered at Woodloch Pines. Food at a vacation destination is very important. And nothing can be more of a hassle than trying to decide where to go, who is going to pay, and how you’re going to get there. That’s why Woodloch just includes meals in its pricing. You don’t have to do anything but show up! What parent doesn’t appreciate not having to cook or clean up?! They do request you dress up a bit for dinner, but it was rather refreshing to do so. At each meal there are plenty of choices both for adults as well as kids, and beverages and dessert are included (just not alcohol). I assure you that you will not leave this place hungry! One thing you’ll want to do before you’re ready to leave for home is to place an order for some of their breads and pastries. Their streusel and cinnamon-topped cakes are simply incredible! I have consistently noticed that the people who work in the Poconos are very genuine and caring. The staff at Woodloch is no exception. From Andrew who helped us to check in, to Lauren our waitress, to Joey the Social Director, who ran a host of fun activities and was tremendously fun, we found the people here to be down-to-earth and truly interested in what they were doing and whether or not we were enjoying our stay. They wanted us to have fun and it showed! While we were guests here we did experience an injury. It was an unfortunate accident, and although scary at the time, did turn out fine in the end thanks to the efforts of the staff on duty at the time, as well as follow-up from the Safety Director and Owners. I was comforted by the fact that the staff did show genuine concern and that they were interested enough not to shelve my concerns, but they instead saw it as an opportunity to improve what they did, and to make sure that their resort and their activities were as safe as possible. I think that speaks volumes about them and the resort they run. When it comes time to plan your next vacation, you may want to do what many other families in this area do – make it easy and bring the whole gang to Woodloch Pines! Read the inside scoop on Woodloch Pines from parents who’ve been there. Disclosure: The author received a complimentary visit to Woodloch Pines for the purpose of this review. She was not required to state any particular view; all opinions are her own.